Rating:This may have been the funniest Candy Apple Book that I have read so far. 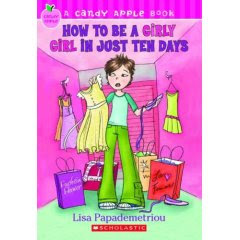 Anyone that has ever changed themselves to impress a boy could probably relate to this book. Description: Nicole "Nick" is a typical tomboy. She doesn't care about her hair, makeup, or clothes. Until she meets Ben. Ben is the cute new boy at school, that seems to have a crush on Nick's biggest rival and ultimate girly-girl Hannah. Nick agrees to a makeover in an attempt to win Ben's attention.